Cat bones found in the farming village of Quanhucun in China gave evidence that domesticated cats were present in China 5300 years ago. Ancient archaeological sites rarely have any cat remains so there is hardly any data available to reveal how they were domesticated. Previously, it was believed cats were domesticated 4000 years ago in Egypt. But the discovery of a wild cat buried with a human in Cyprus dated almost 10,000 years ago has changed that theory. Based on recent DNA studies, the the African Wildcat or the Near Eastern Wildcat, as it is sometimes called, is shown to be the primary ancestor of all domestic cats in the world. This wildcat (see image) is native to Western Asia and Africa and is most the common and widely distributed wild cat. Although this species of wildcat is not native to China, the researchers theorize that the cats found at Quanhucun may have been domesticated elsewhere and brought to the region. The recent discovery also suggest that cats were attracted to ancient farming villages by rodents and other small animals living on the grain that the farmers grew, ate and stored. Five-thousand years before it was immortalized in a British nursery rhyme, the cat that caught the rat that ate the malt was doing just fine living alongside farmers in the ancient Chinese village of Quanhucun, a forthcoming study in the Proceedings of the National Academy of Sciences has confirmed. "At least three different lines of scientific inquiry allow us to tell a story about cat domestication that is reminiscent of the old 'house that Jack built' nursery rhyme," said study co-author Fiona Marshall, PhD, a professor of archaeology in Arts & Sciences at Washington University in St. Louis. "Our data suggest that cats were attracted to ancient farming villages by small animals, such as rodents that were living on the grain that the farmers grew, ate and stored." Set for early online publication in PNAS during the week of Dec. 16, the study provides the first direct evidence for the processes of cat domestication. "Results of this study show that the village of Quanhucun was a source of food for the cats 5,300 years ago, and the relationship between humans and cats was commensal, or advantageous for the cats," Marshall said. "Even if these cats were not yet domesticated, our evidence confirms that they lived in close proximity to farmers, and that the relationship had mutual benefits." Cat remains rarely are found in ancient archaeological sites, and little is known about how they were domesticated. Cats were thought to have first been domesticated in ancient Egypt, where they were kept some 4,000 years ago, but more recent research suggests close relations with humans may have occurred much earlier, including the discovery of a wild cat buried with a human nearly 10,000 years ago in Cyprus. While it often has been argued that cats were attracted to rodents and other food in early farming villages and domesticated themselves, there has been little evidence for this theory. The evidence for this study is derived from research in China led by Yaowu Hu and colleagues at the Chinese Academy of Sciences. Hu and his team analyzed eight bones from at least two cats excavated from the site. Using radiocarbon dating and isotopic analyses of carbon and nitrogen traces in the bones of cats, dogs, deer and other wildlife unearthed near Quanhucan, the research team demonstrated how a breed of once-wild cats carved a niche for themselves in a society that thrived on the widespread cultivation of the grain millet. Carbon isotopes indicate that rodents, domestic dogs and pigs from the ancient village were eating millet, but deer were not. Carbon and nitrogen isotopes show that cats were preying on animals that lived on farmed millet, probably rodents. At the same time, an ancient rodent burrow into a storage pit and the rodent-proof design of grain storage pots indicate that farmers had problems with rodents in the grain stores. Other clues gleaned from the Quanhucun food web suggest the relationship between cats and humans had begun to grow closer. One of the cats was aged, showing that it survived well in the village. Another ate fewer animals and more millet than expected, suggesting that it scavenged human food or was fed. Recent DNA studies suggest that most of the estimated 600 million domestic cats now living around the globe are descendants most directly of the Near Eastern Wildcat, one of the five Felis sylvestris lybica wildcat subspecies still found around the Old World. Marshall, an expert on animal domestication, said there currently is no DNA evidence to show whether the cats found at Quanhucun are descendants of the Near Eastern Wildcat, a subspecies not native to the area. 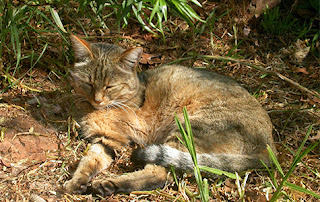 If the Quanhucun cats turn out to be close descendents of the Near Eastern strain, it would suggest they were domesticated elsewhere and later introduced to the region. "We do not yet know whether these cats came to China from the Near East, whether they interbred with Chinese wild-cat species, or even whether cats from China played a previously unsuspected role in domestication," Marshall said. This question is now being pursued by researchers based in China and in France.